A big thanks to Bill D in NC for this very cool Sears Ted Williams 10-Speed. This isn’t your run-of-the-mill plumbing pipe special. Gorgeous paint, lugs, !Campy! Hell, she has even got a cottered crank! This is one of the more unique 10 speeds I’ve ever seen, let alone owned. The bike is made in Austria from lightweight tubing. It has Campy Record deraileurs and shifters. The rims are alloy Weimann with high flange hubs. The bike was sold in SEARS stores as a Ted Williams signature Sport Racer. It has chrome front lugs and internal brake cable routing. I’ve only ridden it once but plan for it to be may regular vintage rider. Allow me to be the first to say THIS BIKE IS TOTALLY AWESOME! That might be the best department store bike ever built. That is very good looking ride. 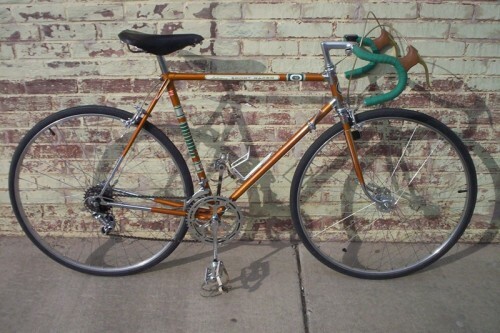 My first 10 Speed was an Austria built Sears bike. (different model) I bought it in about 1972 for my bro`s friend. I foolishly discarded it when I got my drivers licence. That is seriously awesome. I’m very jealous. I’ve been told that Puch built the “high-end” Sears bikes of that time. Absolutely one of the coolest rides I have seen here. Inspiration for all us searchers! Very nice – never seen anything like that. However, why do you claim it as OTS of the Month for May 2010 on your website? It may happen, but I don’t think it’s been voted on yet. cheers and grins! OOOPPPP’s seems I jumped the gun. I didn’t clearly understand the Bike of the Month situation … took it off my web page. Thanks for all the nice feedback on the bike! Put 30 miles on her this morning! OK you’ve earned the TITLE! Post proudly on your web page. Awesome bike! If you ride it to Wilmington sometime, let me see it. This bike has my vote! Bill,any serial numbers visible through the paint on the left side head tube? The only serial # is on the bottom bracket, it’s 2286753. One thing interesting about this bike is that the headset is an odd size, and I was able to determine is Austrian thread on he fork. Gorgeous. I had no idea that Sears sold such a high-end bike. This was made by their regular supplier, either the Austrian companies Steyr or Puch. Probably mid-60s judging from the Record derailleurs, although it looks a bit older. Retro for its time. Fabulous frame details on the head lugs and fork crown. This was already somewhat old-fashioned for its time, but beautifully made nevertheless. A real classic. Thank you all for your comments on my bike. It took a long time to find this model, and it’s my “dream” retro bike for sure. People always notice it when they come in my store and want to buy it but it’s not for sale. Believe it or not I have close to 1000 miles on it since I’ve had it. It’s a great ride. Thanks again! What detailers does it have on it? 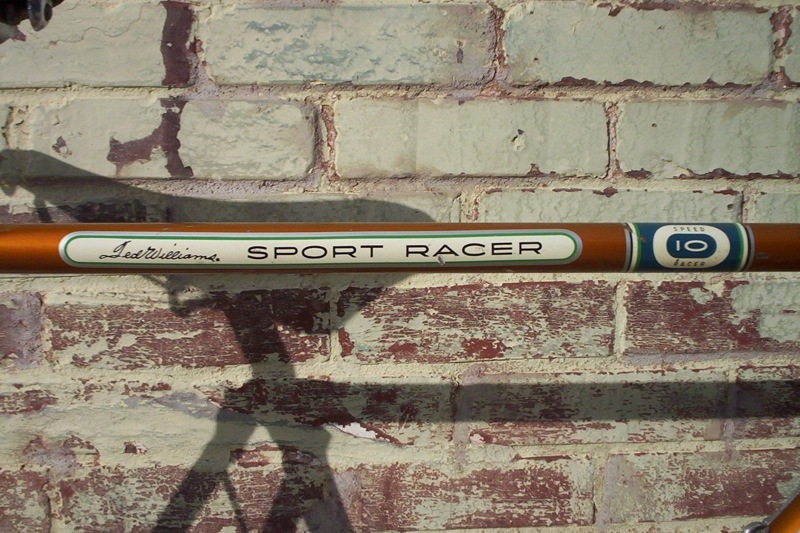 I think I have 2 of these, but one was re-painted, and the other has no Sport Racer badge, the frames are exactly alike. I may be interested in buying it. Can you provide some pics. This was made by their regular supplier, either the Austrian companies Steyr or Puch. Probably mid-60s judging from the Record derailleurs, although it looks a bit older. Retro for its time. 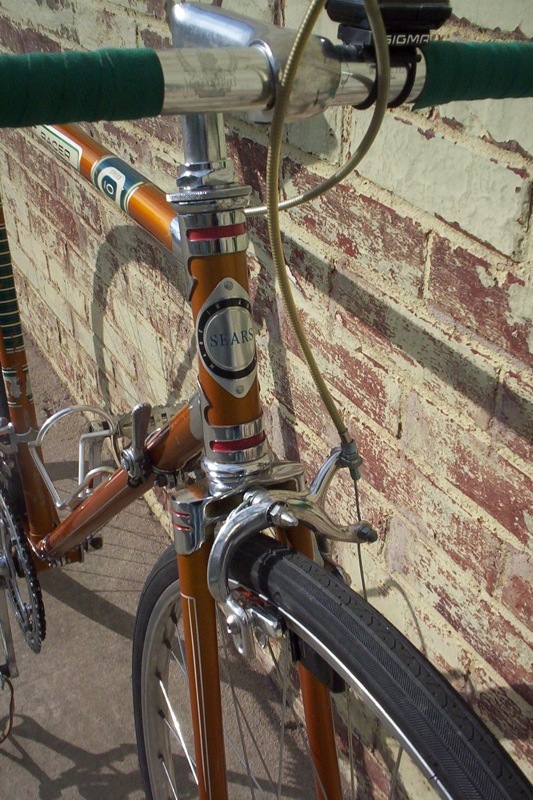 Fabulous frame details on the head lugs and fork crown. This was already somewhat old-fashioned for its time, but beautifully made nevertheless. A real classic. One thing to look for is a decal that describes the type of tubing the frame is made of, either Reynolds, Columbus, Vitus, Falck, Mannesmann or something else. With that kind of worksmanship, and the Campagnolo derailleurs, chances are that the frame is made of some sort of high-quality chrome-moly tubing. It’s a very rare bike, I think, and somewhat odd, so it might be a difficult item to sell for a decent price. Maybe a baseball collector? The bike is not as nice as yours bill, but it is all original. And the exact bike. I figure its a late 60 early 70s because the bike was registered in the city of Sacramento and expired in 74. ( I never even knew bicycle s had to be registered. I for have picks, the bike is dirty( I didn’t want to clean up yet because I noticed the decals are painted and I doubt I can find new ones the put on) but there is no rust at all. I sent emails to both your and spikes response but they only went to the owner of the page. As I said if you are interested ill let it go VERY cheapas long as its wont be resold and loved. I do schwinns but saw this and had to grab it. I gotit and a prestine contenantal sport for free. So my might e interest is in the Schwinn .. I have a Sears Sport Racer from Austria as well. However, it is not labeled Ted Williams, but it does have the same decals otherwise that yours has. It looks much like your photo, only my bike is blue. I got it when I was 15 years old in 1965. There were three models sold – a red one, a blue one (mine), and a gold one, with each model progressively more expensive. Mine has center-pull brakes, a Marcus plastic seat, etc. It still has the original white handlebar tape. I did have to replace one of the rims and the crank many years ago. I still ride it and, in fact, will be riding it from Omaha, NE to St. Louis, MO when I retire at the end of July 2011. For a 46 year old bike, it’s still a nice ride. Concerning my 1965 Sears bike, I have a couple of corrections. I did, in fact, replace the handlebar tape, and the seat is labeled S. Marco (not Marcus). One cool item on the bike is the odometer which is welded near the terminus of the right side fork (and still works!). It is also equipped with an aluminum kickstand, which some people may consider extraneous, but I still appreciate it. I just love this bike because it has been part of my life over the past near 50 years. Wow, this brings back memories. I bought one of these back in 1974-5 from Sears. I think we paid around $110 for the bike. It was a beautiful gold color with chrome accents. Mine had Weinmann rims and those big flange hubs. 10 speed with chrome shifter (painted red in the center with 333 marking), chrome fork, 531 tubing, cotterless cranks, Shimano Crane rear deraillier, Ted Williams sticker, no kick stand (we added a cheapo aluminum one), 27 x 1 1/4 tires, hard plastic seat, black cloth handlebar tape and a sticker that said it was Austrian. I cracked the frame at the seat tube about 2-3 years after I got it and we were able to take it back to Sears and they gave me another bike. The replacement had different stickers, but all the rest seemed the same. Oh yeah, it did have different bar tape (it had that foam junk that I thought was so cool back then). When I was in 7th or 8th grade, my friend and I rode from Glenview, Il to Kenosha, WI and home. It took us forever and I think it was a little over 100 miles. I brought the bike to California in 1987 and I rode it maybe another couple hundred miles. I gave it to my brother in law and it was stolen in the mid 90’s in Ventura, CA. Bummer! These are super cool bikes and what history. And from the big department store of the last generation – Sears! I bought mine from Sears in 1964 at the Macomb Mall in Roseville. The paint looks the same but mine came with aluminum fenders.